Grab your friends - and your enemies - for some matches of epic proportions on these new, large-sized maps! Holding between 4 and 6 players, each map provides exciting opportunities for free-for-all matches, large team matches, and more. The new scenario will leave you fighting for a planet's control against the enemy Substrate in order to hold onto your fortified plateau long enough to seize victory. Against all Odds - Intruder, alert! You've hacked your way into the Nexus that controls both Turinium generators on the planet Qoshyk, but the 4 Substrate entities controlling the planet are now aware of your presence. Mac has subverted the nearby Substrate Guardian and the automated construct swarms are being held in check for now, but how long will that last? Anishanaa: This 6-player map contains isolated starting regions that funnel into epic battles along the map's equator. Pinwheel: Endlessly turning one before the other, don't become too focused on the fight in front of you - the fight from behind will sneak up sooner than you realize. 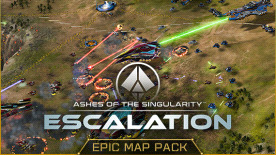 Requires Ashes of the Singularity (base game) to use this DLC.